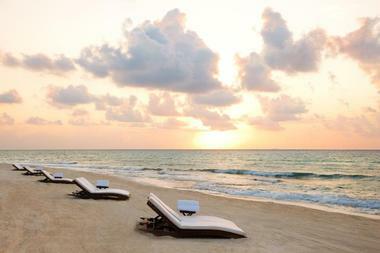 Viceroy Riviera Maya in Mexico is the perfect resort for couples looking for a tropical getaway. Situated right on the beach in a strip of tropical forest, Viceroy Riviera Maya strives to bring an authentic tropical experience from the activities offered right down to the accommodations. The resort aims to immerse their guests in an authentic tropical experience. The villas are spaced throughout the pathways carved into the nearby jungle, with the resort’s more desirable and more expensive villas being located closer to the private beach. All of the villas strive to use natural materials in their construction. The roofs are covered in woven palapa leaves to match the jungle surroundings. The doors and frames are crafted from mahogany, and the outdoor dining room tables are made of carved stone. Guests can sleep in style in their villas’ canopy beds covered in hand-stitched, 500 thread count Egyptian cotton linens. The insides are equipped with all the amenities guests expect from a top-of-the-line resort, plus a few nice extras. All villas come with a king-sized bed, double sink vanities, standing shower, satellite TV with a DVD library, iHome docking station, air-conditioning, and a mini bar. The Villas also include his and her closets with a dressing room, perfect for couples on a retreat. 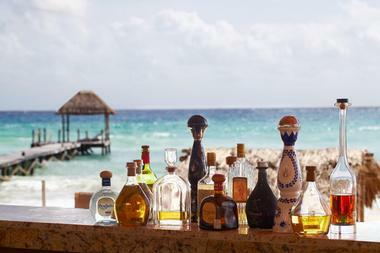 When it’s time to go outside, Viceroy Riviera Maya provides a wealth of amenities. Each villa comes with its own private terrace to enjoy the scenery on chaise lounges. The terraces are equipped with a private heated plunge pool, an outdoor private rain shower, and a homemade crochet hammock. The Luxury, Royal, Signature, and Premium villas all offer views of the jungle from their private terraces. Size is the main difference between the villas, with Premium villas offering nearly double the space of Luxury and Royal villas and Signature villas landing squarely in-between. Luxury Villas have the smallest terrace as well, while Royal villas add a sun deck, and the terrace increases in size as you go up. Signature and Premium villas also add a deep soaking tub inside the villa along with a Nespresso coffee maker. The Ocean View, Ocean View Two Level, and Beachfront villas give excellent views of the ocean with the Beachfront villa seated right next to the sands. The Ocean View villa is mostly identical to the Premium villas except for the difference in view. Beachfront and the Ocean View Two Level villa offer expanded villas with an entry area and foyer. Both include complimentary Majordomo service so that guests can be waited on hand and foot throughout their relaxing trip. The Ocean View Two Level adds a second guest bathroom. The Coral Grill and Bar offers casual, come as you are, dining experience. Located right on the sands, the restaurant is open air so that guests can revel in the smell of the sea and the Caribbean breeze while still enjoying a restaurant experience. The menu features both Mexican and Mediterranean dishes, with a few safer dishes sprinkled in. The Coral Grill and Bar focuses more on fresh, tropical cuisine. Many of the breakfast options feature fresh tropical fruits, and there is a wide variety of seafood options, all caught locally and responsibly. It also features a wood-burning stove for making fresh pizzas. The Coral Grill and Bar is open for breakfast, lunch, and dinner. La Marea Restaurant promises a fine dining experience. Open for dinner, La Marea focuses on Mexican cuisine with a Mediterranean influence and specializes in local, responsibly farmed seafood and local prime meats. The restaurant is indoors, but it is located next to the beach and offers great views of the blue ocean waters. La Marea relies on daily specials to highlight in season foods, so every visit will be slightly different. One of the resort’s policies is eat anywhere. Whether a guest is on a deck, poolside, or in their private villa, Viceroy will deliver a dish to them. The goal is for guests to get the most out of their relaxing, tropical retreat. The Spa at Viceroy Riviera Maya combines the relaxing sights and smells of the ocean with natural restorative herbs from the Mexican jungle. 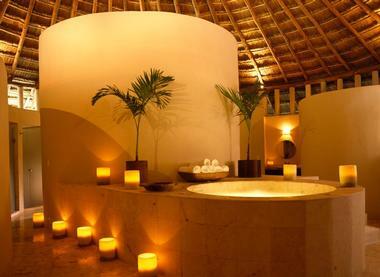 The spa draws on the vast knowledge of Mayan rituals and remedies to help guests find peace and serenity. The Spa offers a wide array of relaxing massages, facials, body treatments, and beauty treatments. Its main focus is relaxing their visitors with an array of massage options. Yoga is performed on the hotel's pier out on the ocean so that the salt breeze and warm sun can help guests feel energized and relaxed. There are also steam rooms and Jacuzzis for the perfect ending to any spa experience. 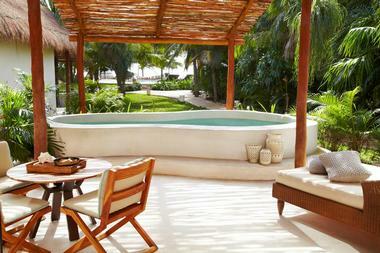 The premiere experiences, however, are The Spa’s Mayan traditional experiences. All Mayan Tradition experiences call upon a different element of Mayan culture, be it the Xaman Ek (Southern Star) or Pachamama (Mother Earth.) The Mayan traditions feature different massages and herbs to not only relax a guest, but also bestow a Mayan blessing upon them. Many of the traditions also involve Mayan rituals in order to bestow the blessing. One such tradition involves bathing in a carved out jungle tree filled with an herbal bath while another uses a special jungle mud to soothe skin. On top of the Mayan traditional experiences at The Spa, Viceroy Riviera Maya offers a couple of Mayan ceremonies that guests can participate in to really experience traditional Mayan culture. The Temazcal ceremony is a special practice used to cleanse a person’s body and spirit to make them fully clean. Temazcal translates to steam house, and it involves a stone mortar structure filled with an herb-infused steam. The structure represents the womb of Mother Earth, and guests who go through the ritual are symbolically born again. Guests participating the ritual are also encouraged to meditate and free themselves from past experiences to focus better on the present. Due to the heat of the steam, guests are encouraged to not wear metal on any part of their body and to refrain from eating for two hours before going through the ceremony. The second ceremony is a Mayan wedding ceremony. Couples are dressed in traditional Mayan garb that represents new beginnings. They are first purified and then are blessed so their union provides peace, love, and abundance. The ceremony ends with participants scattering flower pedals out in the ocean to obtain its blessing. The entire ceremony is done in the Mayan dialect, but couples will be guided through. Viceroy Riviera Maya is next to seven miles of white sand beaches, which means that guests can easily find a piece of the beach just for them. Three hundred and fifty feet of the beach is specially tailored by Viceroy, and this area is dotted by palapa-roofed cabanas available for use by guests. The beach also features a pier that goes out beyond the waves so guests can look out over the tide pools. For guests who wish to get wet, sliding in off the pier offers a great start for snorkelers who want to see some marine life. Beyond the beach, Viceroy Riviera Maya provides a pool as well. Guests can lounge in their private pools or go to the lagoon pool. Located near the beach, the lagoon pool has a selection of loaner sombreros for guests to use as well. Wildlife enthusiasts will have plenty to do at Viceroy Riviera Maya. Numerous diving opportunities surround the resort, and the white sand beaches are protected by a reef system so wildlife reserves for diving are within an easy thirty minutes from the resort. Guests can even dive and see the world’s largest shark, the whale shark. Diving licenses and certifications are available at the resort. For jungle life, the resort offers tours to the Spider Monkey Biosphere. Guests are taken through a traditional Mayan village before hiking through the jungle and canoeing across a river to see spider and howler monkeys up close. Once finished, guests take a 120-meter long zip line back to the village. The Riviera Maya area is home to a wide network of natural caves for which Viceroy Riviera Maya offers tours. The caves are unique in that they feature underground fresh water rivers called cenotes. Guests can explore the caves and go diving and snorkeling through the sacred cenotes for a tour to remember. Expanding on the Mayan culture of the resort, there are a number of Mayan ruins in the area. Less than sixty minutes from the resort are numerous ruins that can have guests trudging through jungles, climbing pyramids, swimming in sacred pools, and learning about Mayan history. The resort offers trained guides to help lead guests through these ruins, and the resort also offers a fly over and tour of an ancient Mayan fort city. Viceroy Riviera Maya offers tours through the local jungle on horseback or ATV. The horseback tours are more romantically minded and allow guests to explore the beach and nearby jungle. The ATV tours are centered toward the adventurous guest and follow jungle trails to a 60 foot deep cenote that guests can dive into and swim. The tour continues to nearby Mayan ruins where guests can have a quick climb before heading back to the resort. For guests wishing to hit the waves, Viceroy Riviera Maya offers a kite surfing class. You go through two days of four-hour lessons and receive an official certification from the International Kiteboard Association. Guests shouldn’t be afraid of heights, as the ocean waves can send kiteboarders thirty feet into the air. For guests wishing to go even higher, Viceroy Riviera Maya offers sky diving by United States trained parachute instructors. The parachutes are specially built to provide upright landings for even the most inexperienced divers. 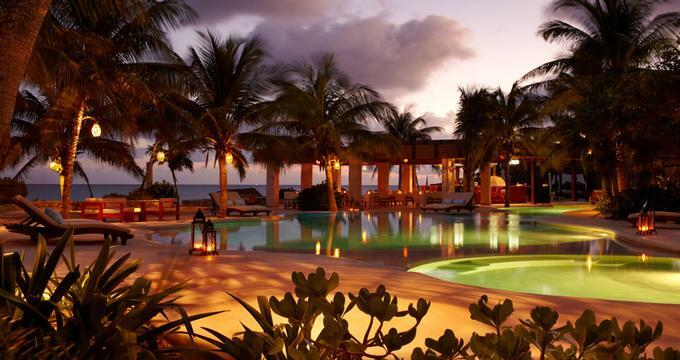 Viceroy Riviera Maya offers transportation to the nearby Playa del Carmen, less than fifteen minutes from the resort. Besides shopping and marine excursions, Playa del Carmen also features Xcaret Park, an ecotourism attraction that is the pride of Mexica. The theme park features Mayan culture and jungle themed attractions. Back to: Romantic Beach Getaways.